These days, a beautiful smile is worth a million bucks. Your cosmetic dentist knows one of the primary features of an attractive grin is a well-aligned bite. If you are dealing with crooked, crowded, gapped, or otherwise misaligned teeth, you are likely an excellent candidate for orthodontic treatment -- but that doesn’t necessarily mean wearing metal brackets and wires for two or more years. Invisalign offers a wonderful alternative to traditional orthodontia. Keep reading to learn more about how it works, and whether or not this clear aligner system is right for your smile. Invisalign is an orthodontic treatment method that uses a series of clear plastic aligners to gradually shift the teeth into the proper position. The Invisalign aligners are sturdy and customized to fit your dentition at each stage of the treatment. Each set is worn for one to two weeks, depending on your unique needs. We will schedule an appointment every 6 weeks to check in on you and make sure your treatment plan is progressing like it should. After about 18 months, on average, the treatment is complete! A retainer will be prescribed for use after to ensure the teeth remain right where they should be for years to come. Wearing Invisalign is easy once you get used to it, and it offers a number of advantages over conventional orthodontics. You should wear each aligner set for 20 to 22 hours each day, but you will be able to remove them before eating to continue enjoying all of your favorite foods. And when it is time to brush and floss your teeth, just give your trays a little attention too to keep them fresh and protect your smile from harmful bacteria. 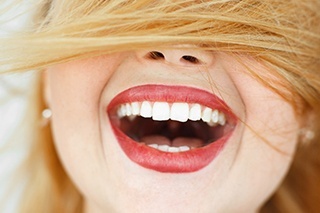 Adults and image-conscious teens appreciate the subtlety provided by Invisalign aligners. While your close friends and family may already know you are undergoing orthodontic treatment, it is very possible that casual acquaintances or co-workers may never notice your aligners. And because they are removable, you can even slip the Invisalign trays out before big meetings or presentations. Life is easy with Invisalign! 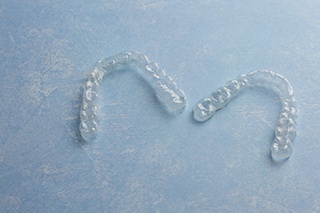 Most patients who could benefit from conventional orthodontics are also eligible for Invisalign. To find out if you are, too, schedule an appointment with Dr. Tillman. He will evaluate your bite, discuss your preference and expectations with orthodontics, and then determine whether or not this is the right treatment for you. If it is, we look forward to getting started right away! Are you interested in straightening your teeth with Invisalign clear aligners? If so, we invite you to get in touch with your Fort Worth cosmetic dentist. Dr. Tillman can’t wait to help you enjoy your most beautiful, confident smile! Schedule an appointment online today.